We do not know precisely how the young Abyssinian girl ended up for sale in Ma kkah. We do not know her 'roots', who her mother was, or her father or her ancestors. There were many like her, boys and girls, Arabs and non-Arabs, who were captured and brought to the slave market of the city to be sold. A terrible fate awaited some who ended up in the hands of cruel masters or mistresses who exploited their labor to the full and treated them with the utmost harshness. A few in that inhuman environment were rather more fortunate. They were taken into the homes of more gentle and caring people. Barakah, the young Abyssinian girl, was one of the more fortunate ones. She was saved by the generous and kind 'Abdullah, the son of 'Abd al-Muttalib. She became the only servant in his household and when he was married, to the lady Aaminah, she looked after her affairs as well. "How strange! How strange! How can my husband go on a trading journey to Syria while I am yet a bride and the traces of henna are still on my hands." "When I saw Aminah unconscious, I shouted in distress and pain: 'O my lady!' Aminah opened her eyes and looked at me with tears streaming down her face. Suppressing a groan she said: "Take me to bed, Barakah." "O Barakah! I have seen a strange dream." "Something good, my lady?" I asked. "I saw lights coming from my abdomen lighting up the mountains, the hills and the valleys around Makkah." "Do you feel pregnant, my lady?" "Yes, Barakah," she replied. "But I do not feel any discomfort as other women feel!" So long as 'Abdullah was away, Aaminah remained sad and melancholic. Barakah stayed at her side trying to comfort her and make her cheerful by talking to her and relating stories. Aaminah however became even more distressed when 'Abd al-Muttalib came and told her she had to leave her home and go to the mountains as other Makkans had done because of an impending attack on the city by the ruler of Yemen, someone called Abrahah. Aminah told him that she was too grief-striken and weak to leave for the mountains but insisted that Abrahah could never enter Makkah and destroy the Ka'bah because it was protected by the Lord. 'Abd al-Muttalib became very agitated but there was no sign of fear on Aminah's face. Her confidence that the Ka'bah would not be harmed was well-founded. Abrahah's army with an elephant in the vanguard was destroyed before it could enter Makkah. "I slept at the foot of her bed and heard her groans at night as she called for her absent husband. Her moans would awaken me and I would try to comfort her and give her courage." The first part of the caravan from Syria returned and was joyously welcomed by the trading families of Makkah. Barakah went secretly to the house of 'Abd al-Muttalib to find out about 'Abdullah but had no news of him. She went back to Aaminah but did not tell her what she had seen or heard in order not to distress her. The entire caravan eventually returned but not with 'Abdullah. "I screamed when I heard the news. I don't know what I did after that except that I ran to Aminah's house shouting, lamenting for the absent one who would never return, lamenting for the beloved one for whom we waited so long, lamenting for the most beautiful youth of Makkah, for 'Abdullah, the pride of the Quraysh. When Aminah heard the painful news, she fainted and I stayed by her bedside while she was in a state between life and death. There was no one else but me in Aminah's house. I nursed her and looked after her during the day and through the long nights until she gave birth to her child, "Muhammad", on a night in which the heavens were resplendent with the light of God." When Muhammad was born, Barakah was the first to hold him in her arms. His grandfather came and took him to the Ka'bah and with all Makkah, celebrated his birth. Barakah stayed with Aaminah while Muhammad was sent to the baadiyah (desert) with lady Halimah who looked after him in the bracing atmosphere of the open desert. At the end of five years, he was brought back to Makkah and Aaminah received him with tenderness and love. Barakah welcomed him "with joy, longing and admiration". When Muhammad was six years old, his mother decided to visit the grave of her husband, 'Abdullah, in Yathrib. Both Barakah and Abd al-Muttalib tried to dissuade her. Aaminah however was determined. So one morning they set off - Aaminah, Muhammad and Barakah huddled together in a small hawdaj mounted on a large camel, part of a huge caravan that was going to Syria. In order to shield the tender child from any pain and worry, Aaminah did not tell Muhammad that she was going to visit the grave of his father. The caravan took ten days to reach Yathrib. The boy Muhammad was left with his maternal uncles of the Banu Najjaar while Aaminah went to visit the grave of 'Abdullah. Each day for a few weeks she stayed at the grave. She was consumed by grief. On the way back to Makkah, Aminah became seriously ill with fever. Halfway between Yathrib and Makkah, at a place called al-Abwa, they stopped. Aaminah's health deteriorated rapidly. One pitch dark night, she was running a high temperature. The fever had got to her head and she called out to Barakah in a choking voice. My heart was shattered and I began to sob and wail. The child was distressed by my wailing and began to weep. He threw himself into his mother's arms and held tightly onto her neck. She gave one last moan and then was forever silent." Barakah wept. She wept bitterly. With her own hands she dug a grave in the sand and buried Aaminah, moistening the grave with whatever tears were left in her heart. Barakah returned with the orphan child to Makkah and placed him in the care of his grandfather. She stayed at his house to look after him. When 'Abd al-Muttalib died two years later, she went with the child to the house of his uncle Aboo Taalib and continued to look after his needs until he was grown up and married the lady Khadijah. Barakah then stayed with Muhammad and Khadijah in a house belonging to Khadijah. "I never left him and he never left me," she said. "I shall never leave you. Does a mother abandon her son?" Muhammad smiled and kissed her head. He looked at his wife Khadijah and said to her: "This is Barakah. This is my mother after my own mother. She is the rest of my family." "Barakah, you have sacrificed your youth for the sake of Muhammad. Now he wants to pay back some of his obligations to you. For my sake and his, agree to be married before old age overtakes you." "Whom shall I marry, my lady?" asked Barakah. "There is here now 'Ubayd ibn Zayd from the Khazraj tribe of Yathrib. He has come to us seeking your hand in marriage. For my sake, don't refuse." Barakah agreed. She married 'Ubayd ibn Zayd and went with him to Yathrib. There she gave birth to a son whom she called Ayman and from that time onwards people called her "Umm Ayman" the mother of Ayman. Her marriage however did not last very long. Her husband died and she returned once more to Makkah to live with her "son" Muhammad in the house of the lady Khadijah. Living in the same household at the time were 'Ali ibn Abi Talib, Hind (Khadijah's daughter by her first husband), and Zayd ibn Haarithah. Later, in public Muhammad proclaimed the freedom of Zayd. However, Zayd continued to live with him as part of his household and devoted himself to his service. When Muhammad was blessed with prophethood, Barakah and Zayd were among the first to believe in the message he proclaimed. They bore with the early Muslims the persecution which the Quraysh meted out to them. Barakah and Zayd performed invaluable services to the mission of the Prophet. They acted as part of an intelligence service exposing themselves to the persecution and punishment of the Quraysh and risking their lives to gain information on the plans and conspiracies of the mushrikoon. "You are blessed, Umm Ayman. Surely you have a place in Paradise." When Umm Ayman left, the Prophet looked at his companions and asked: "Should one of you desire to marry a woman from the people of Paradise, let him marry Umm Ayman." Zayd and Umm Ayman were married and were blessed with a son whom they named Usaamah. The Prophet, may Allah bless him and grant him peace, loved Usaamah as his own son. Often he played with him, kissed him and fed him with his own hands. The Muslims would say: "He is the beloved son of the beloved." From an early age Usaamah distinguished himself in the service of lslaam, and was later given weighty responsibilities by the Prophet. When the Prophet migrated to Yathrib, henceforth to be known as al-Madinah, he left Umm Ayman behind in Makkah to look after certain special affairs in his household. Eventually she migrated to Madinah on her own. She made the long and difficult journey through the desert and mountainous terrain on foot. The heat was killing and sandstorms obscured the way but she persisted, borne along by her deep love and attachment for Muhammad, may God bless him and grant him peace. When she reached Madinah, her feet were sore and swollen and her face was covered with sand and dust. "Yaa Umm Ayman! Ya Ummi! (O Umm Ayman! O my mother!) Indeed for you is a place in Paradise!" exclaimed the Prophet when he saw her. At Madinah, Umm Ayman played her full part in the affairs of the Muslims. At Uhud she distributed water to the thirsty and tended the wounded. She accompanied the Prophet on some expeditions, to Khaybar and Hunayn for example. 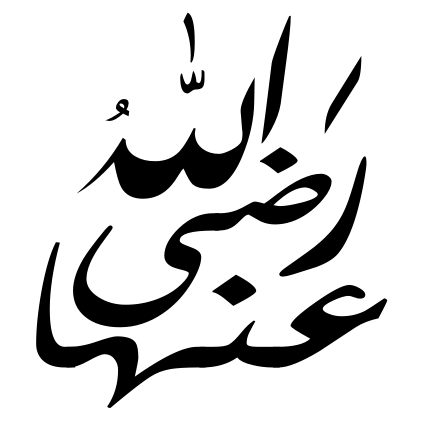 "I am well, O Messenger of Allah so long as Islaam is." "By Allah, I knew that the Messenger of Allah would die but I cry now because the revelation from on high has come to an end for us." Barakah was unique in that she was the only one who was so close to the Prophet throughout his life from birth till death. Her life was one of selfless service in the Prophet's household. She remained deeply devoted to the person of the noble, gentle and caring Prophet. Above all, her devotion to the religion of Islaam was strong and unshakable. She died during the caliphate of 'Uthmaan. Her roots were unknown but her place in Paradise was assured.